Friday’s Jobs Report for February could be a major market mover. Plus, there’s important news on inflation, personal income and spending, and manufacturing. Right out of the gate on Monday, look for Personal Income, Personal Spending and Personal Consumption Expenditures (the Fed’s favorite measure of inflation). Also on Monday, there will be manufacturing news via the ISM Index. The ISM Services Index follows on Wednesday. Wednesday also brings the ADP Employment Report, the prelude to the government’s Jobs Report. On Thursday, Weekly Initial Jobless Claims will be released, as usual. Also look for Productivity for the fourth quarter of 2014. Friday is the big day with the February Jobs Report, which includes Non-farm Payrolls, Hourly Earnings and the Unemployment Rate. 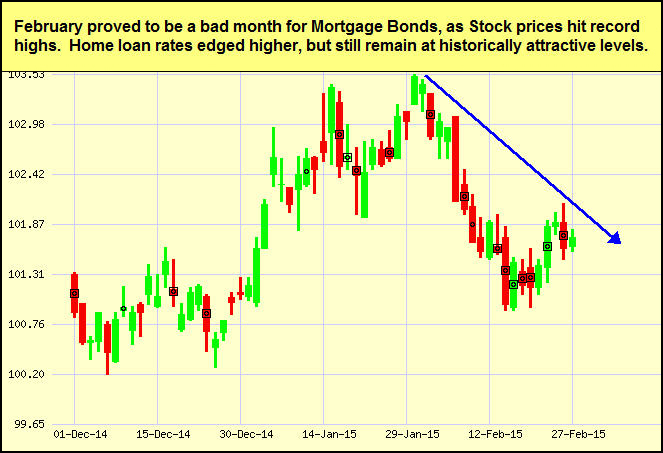 As you can see in the chart below, Mortgage Bonds fell in February as Stocks performed well. Home loan rates edged higher but remain near historic best levels. 1. Promote new ideas. Give yourself and your team permission to come up with ideas that could challenge how you “do things”. This can help you break through outdated paradigms, as well as reaffirm you’re doing some things right! 2. Cross-pollinate ideas. Visit a colleague’s business and find out how they work, or start a mastermind group to get fresh ideas. 3. Get help. Coaches and trainers can offer training and insights for boosting creative power for both individual and group settings. Workshops and consulting sessions can be motivating, morale boosting and give you tools for transformation. 4. Track and measure. When you or your team come up with a creative solution for a new business process, sales boost, or any other advancement, make sure to track its progress over time so that you will understand what works, what doesn’t work and why. Please feel free to pass these creative tips along to your team, clients and colleagues!